I'm starting to think you could go back through the history of Introversion's alpha release videos, and map out the increasing eccentricities of Mark Morris and Chris Delay as they continue to work on the game. 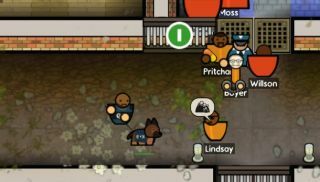 This time: philosophical musings on toilet queues lead into an exploration of the latest update's features, which include dogs, extensive optimisation, and the sale of prisons. Dogs round off the systems added in the last few updates: contraband and escape tunnels. As they patrol through the prison, they'll sniff out hidden narcotics and scratch away at patches of ground, potentially alerting you to escape tunnels. They'll also chase after escaping prisoners, dragging and biting them into unconsciousness. Aww, bless. The update should also significantly increase frame rates on larger prisons, and will let you sell your current design, using the profits to fund you next, even more ambitious high-security project. Prison Architect's alpha 14 is out now, either as a Steam auto-update, or through the game's builds page . The full change list is available on the Introversion forum .